The art department of GCSU invited Judy Baca to hold a day-long workshop for Advanced Painting Students on March 5, 2009 to learn the techniques, practice and theory that she has cultivated over her 30+ years as an artist and teaches her UCLA class, Beyond the Mexican Mural. Though it would be impossible for a one-day workshop to cover as much material as a full ten- to twenty-week course, Baca’s workshops are in depth and rigorous. In only 5 hours, she was able to turn twenty individual art students into one mural team moving from “Affinity Groups” to sketches to full composition and finally blue-line on the wall. Their professors will see them through paint application. 1. 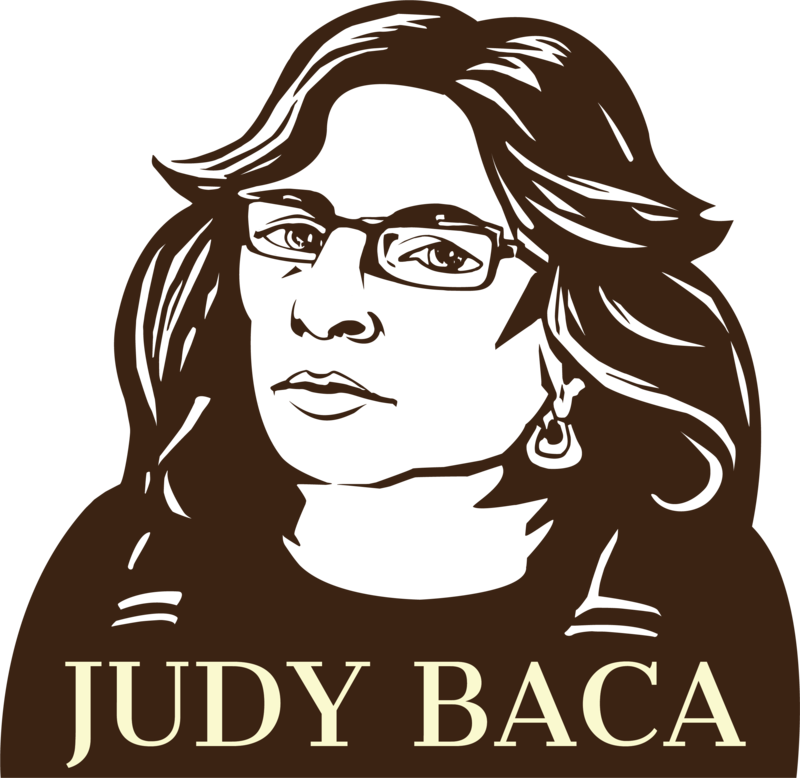 Judy Baca introduces herself and her mural process which follows the theory of Paolo Freire in which content is derived from the overlapping stories of participants. 2. Students are given ten index cards each. They are asked to write on each card a life-defining epiphany and what they learned from the experience, then place the cards on the wall. 5. 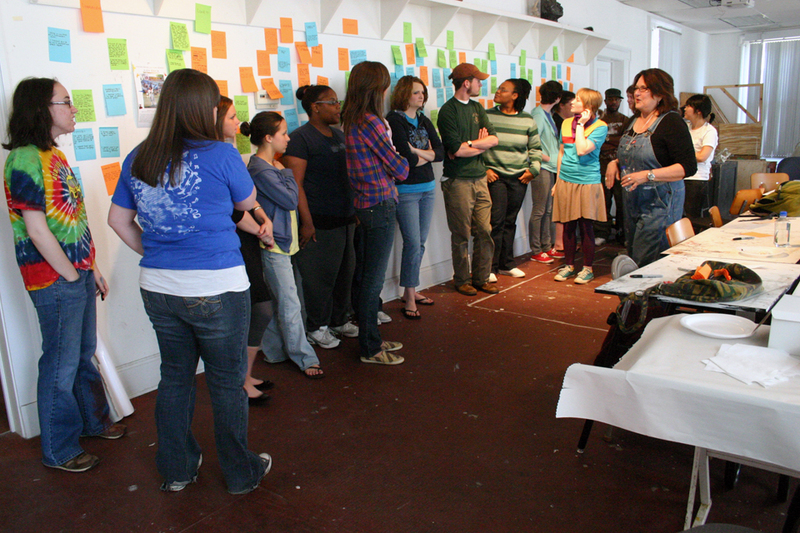 Affinity Groups break off the conceptualize their subjects. Each group will have 2-4 students who will begin by discussing the topic. Often times, each member will produce their own individual sketch but each group will ultimately complete one collaborative drawing. 6. As groups complete their drawings, Judy begins to determine composition and assigns each group to a portion of the gridded wall. 8. Once charcoal drawings are complete, outlines are painted on with diluted aquamarine paint. To complete a mural from start to finish requires a minimum of a two- to three-day workshop. In only one 5-hour day, Judy was able to orchestrate the conceptualization and drawing of a mural that will be colorized by the painting students over the rest of their semester with instruction from Professor Valerie Aranda (far right). Stay tuned for updates as the students finish their work in Georgia . . .
Students of the GCSU Mural Workshop (at the end of a very long and productive day with Judy Baca). March 5, 2009. Progress is made: The students continue to lay in blue-line for outlines and underpainting (images sent in by GCSU professors).